My son Daniel enjoyed making chocolate chip cookies when he was younger. Still does. 🙂 He used the recipe on the back of the Nestlé Toll House chocolate chips package and often doubled it to make cookie bars. 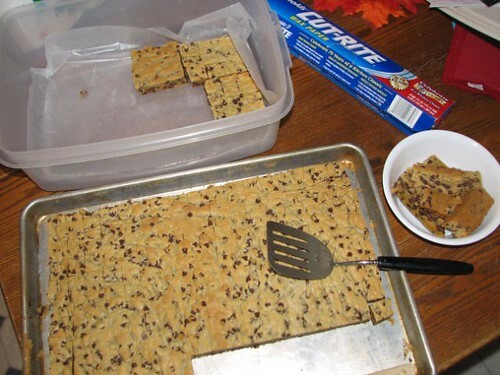 I don’t remember when the idea came to me to use the cookie bars to make these little yummy treats. It seems I have been making them for years. They are a great favorite at the open house. Men seem especially to like them. I underbake the cookie bars by a tiny bit, so the bites are chewy and soft. And I use mini chips so the cookies are loaded with little bits of chocolate. After cutting the bars into 1-inch squares, I dip them in chocolate and sprinkle each one with decors. Add to sugar mixture and combine thoroughly. Spread in a greased cookie sheet with 1″ sides. Bake at 375* F for 17 minutes. 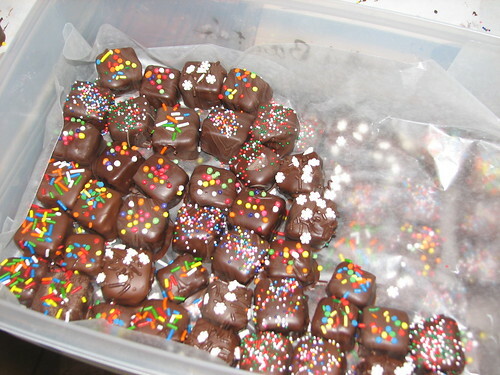 When cool, cut into 1″ squares and dip in melted chocolate. Sprinkle with cookie decorations / decors. For dipping chocolate, I melt chocolate chips and add 2 oz. unsweetened chocolate for each 12-oz. bag of chips. I make the bars ahead, cut them (removing the raised edges), freeze them between sheets of waxed paper and, after thawing, dip them in chocolate the day before our annual open house. When dipping I put them into the melted chocolate upside down so the bottom becomes the top. That ensures the tops of the finished cookies are smooth and the edges as square as possible. I’ve also made the same recipe as little hearts, for a baby shower and for a ladies’ tea, using a 1-inch cookie cutter. 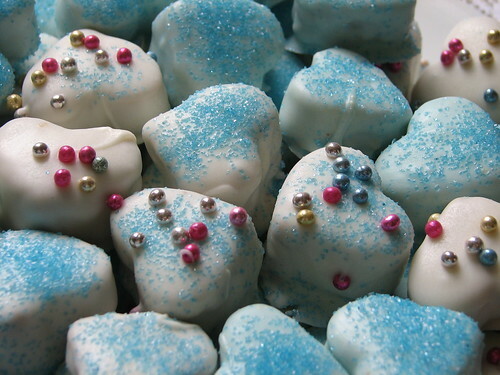 For the tea, I dipped the hearts in dark chocolate and topped them with frosting flowers and sugared violets. This entry was written by ~~Rhonda, posted on December 7, 2007 at 11:41 am, filed under Christmas, cookies, Recipes and tagged Christmas, cookie, Daniel's cookie bar bites, open house, recipe. Bookmark the permalink. Follow any comments here with the RSS feed for this post. Post a comment or leave a trackback: Trackback URL. I was wondering if I could use a big casserole dish instead of a jelly roll pan?Because I dont have any jelly roll pans. I just made these!OMG they made my house smell soo good!! !I am planning on making mine 2″ long because I am not making as many cookies for my trays.I can’t wait to try them dipped in chocolate! I dunno what made me think of this,but I thought it would be a really cute idea to get a mini Christmas tree cookie cutter and shape them like trees and use green chocolate melts to dip them in and use sprinkles like you do..Just thought that would be a cute idea!What do you think? I made a batch and had a hard time getting the middle to cook ….help ,what am I doing wrong ? Had a great batch today. Thanks for sharing your Christmas with everyone ! !